The publishers are keen on a second edition of Digital Wars – it’s “done so well [in sales terms]”, they say. Which is great to hear, though of course that also means adding new stuff. And taking some stuff out as well. There’s room for about 5,000 new words, apparently. The book as it stands is about 90.000 words. So it’s not a huge change. The main narrative would remain the same: prologue, antitrust, search, digital music, smartphones, tablets, epilogue. 5,000 words translates to about 10 sides. An obvious reaction is “add in Facebook, and Twitter, because they’re really big, and you know, there’s lot of people on them.” But I don’t think they fit into the narrative of these three companies. Facebook gets a mention, but only in the context of Microsoft’s pursuit of search. There’s some updating to do about Google and antitrust; the smartphone patent wars; Microsoft and Bing; the position of the smartphone wars now (and BlackBerry’s perilous position, and Nokia’s similarly wobbly situation). But for people who have read it, are there parts that you wanted to see less of? Or more of? One of the things that I wanted to get more of into the first edition, but couldn’t (for space) was the issue of the supply chain. The reason why Apple and Samsung dominate now is that they have such tight control over the supply chain. Samsung has it because it makes its own stuff; Apple, because it has used its cash pile to tie up production. Anyhow, your suggestions welcome for what should be in the new edition. But remember: it needs to fit into the narrative. I’m in what ought to be the final lap of drafting the book: I handed in a first draft in mid-July (about three weeks late). The target: 70,000 words. What I delivered: 101,000 words, though that didn’t include tablets, and of course given the timing didn’t include Apple becoming the highest-valued company in the world ahead of Exxon, nor Steve Jobs resigning. And because of the length thing, I left out the issue of tablets altogether – except that after discussions with my publisher it’s clear that they have to be in there, so what was just going to be a section entitled “Smartphones” will instead, I think, be called “Mobility”, and mix the two together. I’ve been given some room for maneouvre: I’m allowed 85,000 words. The plan is that publication is scheduled for March/April 2012. So delivery has to happen by the first week of October. The other challenge, of course, is that I have to cut the number of words by 16,000, while expanding it to include those new things. Cutting out while also clearing up what’s not quite worded correctly turns out to be very tricky. Compared to the enormous amount of data and detail out there on the web – the interviews, the analyses, the raw numbers – the act of compression down to 85,000 words to cover slightly more than 14 years (from 1997 to the present day) is …challenging. But I just thought I’d say a quick thank you to all the people who helped on Twitter when I asked about the number of employees in Google in mid-2003 (it’s a key date in Microsoft’s search history). Apart from one grumpy response of “I thought you were paid to do the articles yourself”, people pitched in with lots of helpful data. Special thanks to @Angharadbyrne who pointed me to Google’s financials for 2003 (offered, I think, as part of its pre-IPO data), where the answer comes up pretty quickly: 1,100 people. That was about twice as many as Microsoft had gone on its crash project to come up with a rival for Google, begun in January 2003. Oh, that and far more to come…. 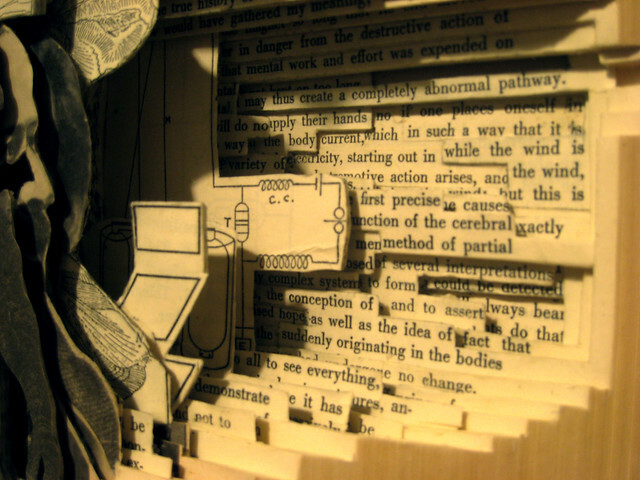 Meanwhile, if anyone has experience of chopping words out of book drafts while refining the content, please tell. Bonus link: http://www.searchenginehistory.com/ – some quite good stuff in there. The incidental detail that turns up in the research for this book just gets more and more enjoyable. Such as: one wants to be accurate: precisely which day of the week was it that Steve Jobs announced that thing he announced in January 2007? (You may be able to think of the name.) I had thought it was Monday, but actually it was Tuesday – 9 January, to be precise. I recall all the stories about how the Consumer Electronics Show in Las Vegas was missing many heavyweight journalists, because they’d gone over to San Francisco to hear Jobs speak, in expectation of the unveiling of the thingummy. And who should be up on the stage at CES at the exact same time as Jobs was at Macworld? Yes, Mr Shut-the-company-down-and-give-the-cash-back, Michael Dell. Ailing computer giant Dell will face off, sort of, against smaller but better-faring rival Apple on Tuesday. Whether it will help Dell, though, is hard to say. Dell founder and board chairman Michael Dell will give a keynote speech at the Consumer Electronics Show in Las Vegas at the exact time Apple CEO Steve Jobs will address the Macworld masses in San Francisco. In case you’d forgotten, here’s a link to his speech (Google Doc). He also threw out the challenge to the tech industry to become more green. I think the tech industry sort o threw it back at him. One also has to love “ailing computer giant” in the first sentence of that Red Herring report. One senses they were being ironic. Although: Apple’s market cap as the day began was $301.8bn; Dell’s was $30bn. Update: And now a picture! Come on, you have to agree that this image has become iconic around the world. Everyone remembers where they were on 9 January 2007 when Michael Dell did his routine with Mike Myers, surely? For just $7.5 billion, you could have bought Apple — in January 2004. That leaves $1 billion to create your time machine. Oh, John, John. If, like I am, you were writing a book about the tangled history of Apple, Microsoft, and Google, and all their business battles down the years (PCs – very briefly, search, music players, smartphones and – I realised with horror as my deadline approaches – tablets too) then you’d have gotten into the habit of querying each and every fact that you write down, and resolving that you have to figure it out. (To anyone late to this party, which I know includes a lot of people: yes, I am writing a book, tentatively titled The Rivals, which I’m aiming to deliver in the next couple of months to publishers Kogan Page, who will turn it into something beautiful by cutting out the rubbish, and then print it in 2012. If you’ve worked for Apple, Microsoft or Google, then yes, I’d love to hear from you: get in touch. And yes, I have found out some very interesting things about precisely why the iPhone succeeded, what happened to search inside Microsoft, what Googlers think of Microsoft, and why tablets are like wars fought with air power. There’s lots to tell. Be patient. As part of the research, I’ve done stuff like going back over every single Apple quarterly report to 1994 (thank you commenters who pointed me to it), Microsoft’s quarterly reports to the same period (stunningly uninformative), and of course Google’s financials (nicely laid out). 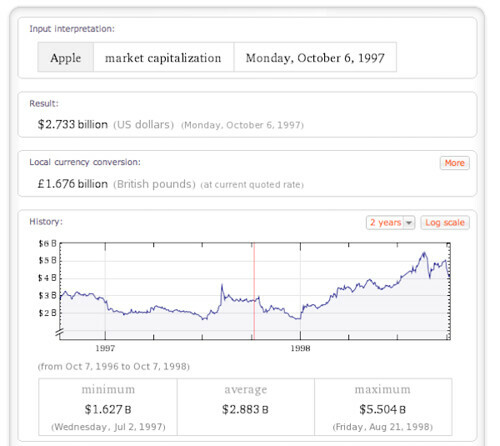 But when you want to look at figures like market capitalisation – which, let’s remind ourselves, is the market’s guess at a company’s total future profits (perhaps on a discounted cash flow basis, ie allowing for inflation) – then there’s only one search engine you need: Wolfram Alpha. The magical thing about WA (as I’ll call it) is that it stores all sorts of financial data, and it will also calculate market cap without blinking. Personally, I think that buying Apple in January 2004 wasn’t the smart time to do it. Why not have a look at another famous time for buying Apple – the day when Michael Dell suggested shutting down the company and giving the money back to the shareholders? Apple market cap 6 October 1997. Hit return. Which means that with $8bn, you’ve got $5.3bn to build your time machine, John. In fact it even offers the insight that the real time to get in there was to buy it on 2 July 1997 – when it was worth just $1.627bn. You could build that time machine and have money left over. Its developer, Lyndsay [CORR Lyndsay] Williams, hit on the idea when she was trying to navigate her way through a map on Cambridge on the Web to find a specific location. Although Microsoft is best known as a software company, it has recently moved into making hardware with its Xbox games console, to be released in Europe in March, and says “major hardware manufacturers” will offer pen-operated tablet-shaped PCs, made to its specification, “in the second half of 2002”. The Tablets would be the ideal format for the new ultrasonic system – although some observers have cast doubts on whether the shape will prove popular with users. If Nokia is a bureaucracy, and Microsoft is a political party, then what are Apple and Google? The problem Stephen Elop faces now is not a technical one. I’ll offer another Unpopular Opinion here: that WP7 is really remarkably good already. If it wasn’t called Microsoft Windows Phone 7, and had it instead originated with a plucky startup more people would be able to appreciate it better. The Microsoft imprimatur ensures WP will never be cool – but does at least give it some assurance of backing. Elop is correct in identifying Android as a mad sharkpool of manufacturers thrashing around in pursuit of a tiny profit, eating each other in the process. If he had to plump for an OS to license, of the two, WP was the better choice. Elop’s problem is that historically you can’t really take a large bureaucracy and expect a lean, mean fighting machine to emerge. You usually just get a smaller bureaucracy. Nokia’s problem is not, and has never been, that it lacks for creative, thoughtful, talented people, or the resources to turn their ideas into shipping product. It’s that the company is fundamentally, and has always been, organized to trade in commodities. Whether those commodities were stands of timber, reams of paper, reels of cable, pairs of boots, or cheap televisions for deployment in hotel chains, much the same basic logic applied: acquire, or manufacture, great quantities of a physical product for the lowest achievable cost, and sell for whatever the market will bear. Which got me thinking: well, then, Nokia is a bureaucracy. A formidably effective one, but a bureaucracy nonetheless; and of course the purpose of a bureaucracy is to sustain its processes – not to change. In that light, what sort of organisation is Microsoft like? In my opinion, a political party. Because: it has certain core principles (revenue from Windows must be protected, revenue from Office must be protected) but it is willing to reinvent itself around other areas of what it “believes” – so it’s perfectly willing to dump Windows Mobile and cook up Windows Phone instead. It’s just like the way that New Labour reformatted itself – dumping “old” ideas like Clause 4 while holding on to “core” beliefs such as social justice (don’t let’s argue about whether it managed that; just that it was in its manifesto) or the Conservative Party under David Cameron, (doing its best at) dumping European hatred but holding on to other core Tory beliefs such as smaller government. Looked at through that lens, you can see Microsoft reinventing itself with the Xbox, and Kinect, and Windows on ARM, while remaining true to its core principles. In which case, what is Apple? Please don’t say “cult” – that doesn’t embrace its willingness to tear apart things that are working, such as its readiness to dump the iPod mini and replace it with the iPod nano. And how about Google, with its multifarious products swimming in a sea of competitors? In each case, what is the best analogy or metaphor for those two? Is Apple like an army led by generals who are ready to tear up the rulebook? Is Google like a university? Over to you. Suggestions please..
On 1 December 2000, I met Koji Hase of Toshiba, who was over in London on a meet-and-greet to promote Toshiba’s newest and smartest technologies. Wow, really? I’ll be able to download news clips to my watch? Note the other bit of technology he mentioned – the one that might be enough to hold a film. Guess where that showed up 10 months later. This article originally appeared in The Independent – or at least was slated to – on December 2 2000. In a few years’ time you’ll be able to download news clips and look at them on your watch. You’ll also be able to buy entire films stored on computer discs no bigger than a credit card and watch them on your PC. And well before that you’ll be able to buy a DVD player which will also record – just like your video can. Says who? Says Koji Hase, vice-president of strategic alliances at the giant Japanese corporation Toshiba. And if you think he might be wrong, consider this: this is the man who gave the world the CD-ROM and the DVD disc, and who one evening over dinner with Apple Computer’s former chief dreamed up the phrase “personal digital assistant” for machines which you could carry around with you to take notes. Mr Hase thus has a better, and longer, technological track record than many people in the computing industry. Yet he remains optimistic and excited about what the future is going to bring – especially the thumbnail-sized cards that Toshiba is developing which will be able to store up to 1,000 megabytes (1 gigabyte) without needing a power source. Toshiba is also working with other Japanese, European and American companies to develop miniature hard discs which are just 1in (2.5cm) across. That compares with 3.5in (8.9cm) for the hard discs now standard in computers. By making it impossible to copy or change the disc’s contents, it could then become a medium for selling films for viewing on PC – which would remove the need for big, power-hungry drives now needed to watch a DVD on a laptop or PC. But before that format is widely accepted – or priced anywhere near DVDs – he is sure that we will have recordable DVDs in the home, and that their price will fall below the psychologically important $1,000 in the US within three years. After that, “DVD-Read/Write” (as it is known) will take over the world, he believes.